Ludhiana lived to its reputation of being the most polluted city in the state even as the rest of the world celebrated environment day today. The local industry continued to pollute the air and water and the vehicles emitted poisonous gases like any other day here today. The Punjab State Pollution Control Board (PPCB) remained a mute spectator to the pollution caused by various sources as usual. Except organising a program in collaboration with Bhartiya Jan Gyan Vigyan Jatha here yesterday, the PPCB failed to do anything in concrete with no change in the ground realities or the prevailing bad environmental conditions. The authorities concerned have been unable to check the spread of pollution caused by auto-rickshaws or by some industries, which discharge their waste into the Budda Nullah. Several industrial chimneys, too, continue to release black smoke into the sky. The recycled poly bags and other plastic goods remain in use. The auto-rickshaws release toxic emissions but the authorities have not bothered to check the menace. Even the pollution monitoring unit, which was put up in city after spending lakhs of rupees remains in non-working condition. Although the SPM seems to be quite high in this season, there is no monitor in the city, as it was removed from its place years ago. Residents wonder how long will it take for the board to repair it. Meanwhile, the municipal corporation also came under fire today as the MC gardeners put dry leaves and other garden waste on fire in the morning. “This is not a new thing for the walkers. But what agitated us was that they could have done without this practice at least for today as a mark of celeberation,” said Sham Singh Harike, a resident. He said that neither the enforcement agencies nor the administration had given a call to the residents to ensure a cleaner day at least today. “The NGOs also think that after organising a function to mark the day, their duty is over. But we need to do something concrete on the ground,” said Harike. The most polluted water body of the city, Budda Nullah flew silently carrying pollutants throughout the day. “The industry could have been asked not to discharge effluents into the nullah for a single day. Maybe this could have led to some awareness and sensitised the masses. But nobody wants to work here. They just want to sit in their air-conditioned offices ,” rued S.S. Chana, a resident. It is an irony that even on World Environment Day the officials responsible for protecting the environment failed their duty and literally turned a blind eye to the widespread and indiscriminate ravaging of the precious green belt along the Ferozepore road. And senior officials of the forest department responsible for the protection of the green belt in the area remain unmoved. When the issue was brought to their notice, they remarked, rather in a casual way: “Let us see, if we can nab anybody red handed”, as if the violators of the law will inform them in advance. As if the huge waste generated by the marriage palaces along the Ferozepore road from outside the octroi post up to Mullapur Dakha was not enough, now the polluted water from various industrial units has started being thrown out there through tankers. This has already started showing its effects as the grass has already turned red. With the officials not so keen to take any action against those damaging the environment, the dumping process continues unabated. Quite intelligently, the marriage palace owners do not dump their waste at one place. Every day they spread it out at different places to ensure the dump does not pile up too big to become obvious, lest they be noticed. Most of the waste generated by the marriage palaces is non-biodegradable and it does not dissolve even after being burnt. The experts say it needs high temperature incineration like for the disposal of the biomedical waste. The effects have started being felt with even the nearby fields now being extensively littered with plastic bags, plates, cups and glasses. Farmers have also lodged the complaints with the authorities concerned but without any positive results. And now they have the dirty water also flowing into their fields. The officials seem to be criminally callous and indifferent. Surprisingly the forest officials maintained that as long as they do not catch anybody red handed the department could not initiate any action. When confronted that so much waste had already been dumped and somebody obviously might have done it, they dismissed the arguments with disdain saying let us do our job. In fact, the forest department could seek the cooperation of the police, the public works department and the panchayats. However, there appears to be no seriousness on their part which is explained by the fact that not a single complaint, leave apart an FIR, has been registered against anybody so far, despite the environment having been extensively damaged endlessly. 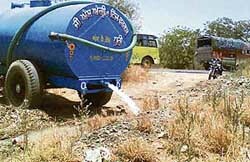 After polluting the Budda Nullah, the municipal corporation and the dyeing industry are now “killing” the forest cover on roadsides as a number of trees on the Ludhiana-Jalandhar road are dying slowly, thanks to the chemical-laced water released in the forest land. Though the problem is assuming alarming proportions as the untreated water can even pollute the underground water besides killing trees, the forest department and the Punjab Pollution Control Board continue to turn a blind eye. A visit to the area today revealed that untreated water and sewage was being discharged on the forest land on the either side of the road. Nauseating fumes of chemicals were witnessed on the spot where the water was collected. Inquiries revealed that industrialists had themselves laid private sewerage system that was being emptied into the forest land. This had killed at least 100 eucalyptus trees and several others are struggling for survival as water mixed with toxic chemical is being discharged by the dyeing units. The trees have already died on a 2-km stretch on the GT Road starting from near Greenland School up to the octroi post on the Jalandhar road. Now the water has been released in Aman Nagar area also. As impurity has become a major concern, the government has decided to make the hallmarking of all gold and silver jewellery mandatory from the next year. All that glitters is not gold. Maybe it was while keeping this dictum in mind that the government decided to making mandatory the hallmarking of all gold and silver jewellery to assure its purity. The rule will come into place next year. Compulsory hallmarking means every article of jewellery that is bought would bear a mark stating the purity of the metal. So far only 316 jewellers in this region have taken license from the Bureau of Indian standards (BIS). "On an average it has been found that there is 13 per cent impurity in gold. The highest impurity detected was 44 per cent in a survey conducted by the government recently. As hallmarking would be mandatory from January 2008, customers would be able to get the quality that they pay for and would not be duped," deputy director general BIS Bhupinder Singh told Ludhiana Tribune today. With gold not remaining restricted to ornamental use and becoming an attractive investment option, impurity has become a major cause for concern. Compulsory hallmarking is also expected to increase India's share in global jewellery trade which is three per cent at present. To ensure complete adherence BIS plans to cover all jewellers including small ones in different phases. Initially, penal measures would be taken against those found engaged in misusing the hallmark. A customer would have to pay a nominal amount, Rs 18 for a gold article upto 20 grams, Rs 50 for an article up to 50 grams and Rs 100 for articles more than 100 grams. Nominal amount would be charged in case of silver items too. Jewellers, who have the BIS licences would be able to get their jewellery hallmarked from centres meant for this which would be located across the country. The region got its first such centre, named L D Gold Lab, in the city today. “This is the first centre in the northern region and another one is expected to come up in Panipat soon. it would be our endeavour to cover all districts,” added Singh. Such centres, which are being opened by private parties, also get a subsidy from the government to the tune of 15 per cent of cost of machinery or Rs 15 lakh, whichever is lesser. The BIS, which provides recognition to these centres, is also generating awareness about hallmarking among jewellers and customers. Local industry appears to be in no mood to adhere to P Ram Committee’s regulations on not throwing their waste in sewerage. Alleging that it was adopting “anti-industry” activities, a section of industry has demanded that the P Ram Committee be dissolved and a new committee be formed in its place. Industry representatives are also planning to move court on the issue. A delegation of industrialists, who met Chief Minister Parkash Singh Badal at Chandigarh today, said only 876 units fell under the ‘red category’ and that the green category industry should not be “restricted from throwing their waste into sewerage”. Industrialists said this committee was formed under the Congress regime and formation of a new committee would ensure removal of bias. They also said that if recommendations of the committee were implemented, it would harm industrial growth in Punjab and result in closure of a large number of units. It was a group of drug addicts who killed an ice-cream vendor near the Jagraon bridge here on May 31. The police claimed today that the accused murdered him for just Rs 600 in their desperation to arrange money for buying a dose of narcotics. SSP R.K. Jaiswal said two of the three drug addicts had been arrested. They had waylaid the vendor, Jagdish Shah, and stabbed him more than 10 times and looted all cash. The arrested persons were identified as Jatinder Kumar and Bharat Bhushan. The accused were so hooked onto the drugs that they even demanded a shot from a bottle that was recovered from them. A large number of farm women and farmers participated in the celebrations of World Environment Day, organised by the Directorate of Extension Education, PAU, Ludhiana, at Sherpur Kalan village, in collaboration with the cooperative societies. Speaking on the occasion, Sat Pal Mehra of the extension directorate, underlined the need of saving environment from pollution, consuming healthy and clean food. He also distributed prizes and plants to the villagers. The coordinator, Dr Neelam Mahajan, spoke about the significance of World Environment Day to create awareness among the general public about the environment with the theme for 2007 being “Climate Change” and “Keep the home and surroundings clean”. Dr Swaran Singh Saini, senior agronomist, discussed various aromatic and medicinal plants and demonstrated original samples of haldi, mentha, asparagus, tulsi, ashwgandha, molathi, gilou, bach, hazardani, kuargandal, brahmi, punarnava, and also distributed haldi seeds. A separate function was also held by the Waatawaran Sambhal Society at Dhanansu village. Speaking on the occasion, Jagjit Singh Mann and Naveen Vishwaharti, two teachers, who are playing a crucial role in building up an environment movement in the rural areas, underlined the need of participation of the masses in saving the environment. They also launched the Triveni Mission to plant trees extensively in the rural areas. The Art of Living is organising an art excel and youth empowerment seminar (YES) for the youth in the age group of 8 to 13 and 14 to 18 years, respectively from June 11 to 16. According to Sumit Mahajan, YES is an innovative educational and lif- skills programme that provides young students the tools to achieve their ideal life with ease, creativity, energy and inhibition free attitude. “The growing demands placed on an individual to be successful in our fast-paced, stressful society make it even more necessary for school and college students to acquire the tools to take responsible life decisions with confidence and clarity, more joy and enthusiasm”, he observed. He claimed, ‘YES’ course empowers students to become more centred and focused, to manage negative emotions and to live life with increased awareness, perception and expression. He claimed, the programme has been taught in the top schools and colleges in the world including MIT Boston, Universities at Chicago, Michigan, Harvard and several IITs in India and in many schools in Ludhiana as well. The sangat darshan programme has brought people closer to the government as more and more people are coming to these durbars to get their grievances redressed. Sumer Singh Gurjar, Deputy Commissioner, said 35 new complaints were submitted today. Discussing the reports submitted by different officers on pending complaints marked to them during previous programmes, as many as 30 pending complaints were cleared as per the satisfaction of the complainants. The DC asked the officers to accord priority and dispose of the complaints marked to them within a week. On a complaint of Davinder Kumar about non-execution of mutation of his plot in his name pending since a long time, the Tehsildar (East) said that there was no entry in the accord about this piece of land even in the name of person, who had sold the plot to him. On this, the DC directed the Tehslidar to go through the back record of about 10 years to establish the ownership and identify the official, who had committed the irregularity while preparing the new zamabandi, so that the complaint could be redressed and the guilty official could be punished. On another complaint of two labourers, regarding the non-payment of their remuneration, the DC directed BDPO, Pakhowal, to get the payments cleared and submit a report in the next programme. Gurjar directed the BDPO to vacate the illegal possession on an irrigation channel, as demanded by Baljinder Singh in his complaint under the PP Act. On a complaint of Surjit Kaur regarding the installation of electric poles for putting up a power transformer by a private builder in Gurdev Nagar area, the DC asked the PSEB authorities not to give power connection without clearance from the municipal corporation. He also told the MC to check whether the transformer was creating unnecessary problems in the residential area. Discussing a complaint of the panchayat of Jand village regarding the illegal sale of earth produced from digging of a drain, the DC directed the BDPO to register a case of theft against the guilty and sought police help to correct the alignment of the drain after getting demarcation from the revenue official. In another complaint of two shopkeepers, whose shops were demolished at old bus stand, he directed the MC authorities to allot suitable sites to the dislocated shopkeepers as per the commitment made earlier. On a complaint by the residents of Arya Colony regarding the illegal setting up of an industrial unit in the residential area, the DC asked the MC authorities to immediately stop the execution and submit the report in the next programme. Others present on the occasion included Pryank Bharti ADC (D), Neeru Katyal assistant commissioner (grievances), Amrit Gill SDM (West), Jagjivan Jit Singh SDM (East), Gurlovleen Singh, SDM, Jagraon, Sukhdev Singh Mann, SDM Samrala, Sukhminder Singh Gill, SDM, Khanna, J P Singh, DDPO, and Inderpreet Singh Kahlon, DRO. She lost her husband during a recent violence related to the Sacha Sauda conflict. Now when she is coming to terms with the reality, Parwinder Kaur (24) has resolved to help Sikh girls who had lost their parents during the violence. Her husband Kanwaljit had joined a religious congregation at Talwandi Sabo on May 17 and was shot dead outside a dera on return. “What is more important for me is that lakhs of Sikhs led by apex organisations of the community have recognised the supreme sacrifice of my husband. Though we have been told that Sikh organisations and individuals across the world have contributed lakhs for welfare of my family, we are yet to receive the amount,” said Parwinder. She grieved that contrary to SAD’s tall claims about recognition of the sacrifice of Kanwaljit, his assassins were not arrested yet. When asked about the future recourse of her life, Parwinder said she would follow the path of Sikhism as shown by her martyred husband. “Besides preparing my daughter Manjot for the service of Sikh panth, I will dedicate myself for the cause of hundreds of Sikh girls who had been orphaned in the communal violence,” she said. Lamenting attempt of certain leaders to harness political mileage out of the incident, she said: “My husband was a follower of Guru Gobind Singh and laid his life while protesting against alleged blasphemy by Gurmit Ram Rahim. As he (Kanwaljit) was not associated with any of political parties, nobody will be allowed to play politics on his sacrifice,” said Parwinder. Death of Kanwaljit has left lives of at least three females in lurch. While Manjot (daughter) is too young to understand that his father had been engulfed by communal hatred, Gurmit Kaur (Parwinder’s mother) is totally shattered that her daughter was widowed at such a young age. A migrant labourer died here yesterday due under mysterious circumstances. According to information available, Mahesh Rai, a resident of Bihar, was working at a motor of a farmer, Lal Singh, with his party at Raipur village. All members of his party had been out to work, during the day. At about 6 pm, when they returned to the motor, they saw Mahesh lying uncouncious on his bed. A bottle was also found from the site. He was rushed to the hospital but later at night, he died. The exact cause of his death could not be ascertained. The dead body has been sent for a postmortem examination. Thousands of activists of the Bairagi Mahamandal Punjab would reach Mahrauli (Delhi) to pay tributes to Baba Banda Bahadur on June 9, his martyrdom day, claimed Krishan Kumar Bawa, president of the organisation. While talking to the Ludhiana Tribune, after convening a meeting of office bearers of the organisation at local Jandali Road, Bawa claimed that the activists were enthusiastic about paying tributes to the martyr at the place where he was martyred on June 9, 1716. “After coming to know that Baba Banda Bahadur was martyred at Mehrauli in Delhi after being arrested from Nangal Garhi in Punjab, the community asked us to celebrate the anniversary at Mehrauli and plan accordingly,” said Bawa. He further added that a cavalcade of vehicles would leave Punjabi Bhawan Ludhiana on June 8. A book authored by Dr Harchand Singh Sirhandi would also be released at a function to be held at Punjab Bhawan. Tanishq, a jewellery brand from the Tata group, today launched a new exchange offer for its customers wherein after assessing the purity of their gold, it would provide them with gold at a lower rate. Addressing a press conference here today general manger Mayank Kampani said,"The idea with coming out with the offer at this time is to cater to the farming community which looks forward to new purchases after the harvesting season." The apex chamber of commerce and industry, Punjab, has written to Prime Minister Manmohan Singh that the steel units of the country have not paid any heed to his advice and raised the prices arbitrarily. The rise in steel prices was causing great hardships to the steel-consuming industries, particularly the small industries. In a letter to the Prime Minister, P D Sharma, President, apex chamber of commerce and industry, Punjab, has pointed out that the steel producers have not taken a serious note of his warning instead they have again raised the prices of HR coil by Rs 1,000 per metric tonne. Sharma has stated that the steel producers have refused to discard the cartelisation as desired by the Prime Minister, while addressing a meeting of the CII. He has pointed out that during 2006-07, the net availability of finished steel from domestic sources was 39.64 million tonnes against the consumption of 43.74 million tones. Despite this the steel producers are exporting steel. Net availability of HR coil for the domestic market in 2006-07 was 90.18 million tonnes against the consumption 10.58 million tonnes as the five major producers exported over 1.37 million tonnes of HR coil. HR coils were exported at a price, lower by the US dollers per metric tonne compared with the realisation from domestic market. This meant that they were instrumental in creating scarcity and enhancing the prices in the local markets. Sharma has also contested the basis for fixing the price on import-parity basis, which is illogical. The steel producers also add occasion freight of $ 60 per metric tonne besides customs and other duties of 6 per cent and port charges extra for the global prices. He criticised the steel minister for his claim that the combined profit of state steel plants has risen from Rs 5,426 crore in 2003-04 to Rs 15,687 crore, an increase of 189 per cent and accused that the consumers had been fleeced. He maintained that even if the price of steel was fixed on import-parity basis, the price of steel should have been reduced by Rs 1,000 per tonne due to strengthening of the rupee against dollar. Contrary to this the price has been raised by Rs 1,000 per tonne. Sharma has lamented that due to the hike in steel prices, the small steel industry is becoming a victim and over a period of time many units will shut down. He has further stated that states like Punjab are away from the source of steel and suffers due to freight charges as well. The government had abolished the freight equalisation principle. But now the steel Minister had made a policy to include freight component if the steel is sent to rural areas. Sharma has called upon the Prime Minister to intervene personally to save the industry from complete collapse.